Obama Delivers Much-Anticipated Berlin Speech Democratic presidential hopeful Barack Obama spoke in Germany Thursday to a crowd that Berlin police estimated at more than 200,000. NPR Washington Editor Ron Elving and Constanze Stelzenmuller, director of the German Marshall Fund in Berlin, discuss how his remarks will be received in Europe and in the U.S.
Democratic presidential hopeful Barack Obama spoke in Germany Thursday to a crowd that Berlin police estimated at more than 200,000. NPR Washington Editor Ron Elving and Constanze Stelzenmuller, director of the German Marshall Fund in Berlin, discuss how his remarks will be received in Europe and in the U.S.
Talk about Obama's travels abroad on Blog of the Nation. Barack Obama, the presumptive Democratic nominee spoke to a huge crowd around the Victory Column in Berlin's Tiergarten(ph) this evening, Berlin yime, about two hours ago now. Police estimate that some 200,000 people came out to listen to the address. In his speech, the only formal address in a week-long foreign tour, Obama called on Europeans and Americans to stand together to quote, "defeat terror and dry up the well of extremism that supports it, and, to fight threats from climate change to nuclear proliferation." And he was clearly speaking to two distinct audiences today, in Berlin of course, and also to voters listening and watching here in the United States. We're going to hear some excerpts from today's speech where Obama said this city of all cities knows the dream of freedom. He called, reminded everybody that this city, Berlin, was a flash point of the Cold War. Senator BARACK OBAMA (Democrat, Illinois): This is where the two sides met. And on the 24th of June, 1948, the Communists chose to blockade the western part of the city. They cut off food and supplies to more than two million Germans in an effort to extinguish the last flame of freedom in Berlin. The size of our forces was no match for the larger Soviet army. And yet, retreat would have allowed Communism to march across Europe. Where the last war had ended. Another world war could have easily begun. And all that stood in the way was Berlin. And that's when, that's when the airlift began. When the largest and most unlikely rescue in the history, brought food and hope to the people of the city. The odds were stacked against success. And the winter, a heavy fog filled the sky above and many planes were forced to turn back without dropping off the needed supplies. The streets where we stand were filled with hungry families who had no comfort from the cold. But in the darkest hours, the people of Berlin kept the flame of hope burning. The people of Berlin refused to give up. Senator OBAMA: And on one fall day, hundreds of thousands of Berliners came here, to the Tiergarten, and heard the city's mayor implore the world not to give up on freedom. There is only one possibility, he said. For us to stand together, united, until this battle is won, the people of Berlin have spoken. We have done our duty, he said. And we will keep on doing our duty. People of the world, now do your duty. People of the world, look at Berlin. CONAN: Barack Obama went on to talk about the challenges of working together across the Atlantic Ocean. No one nation, no matter how large or powerful, can defeat challenges alone. None of us can deny these threats or escape responsibility in meeting them, yet in the absence of Soviet tanks and a terrible wall, it has become easy to forget this truth, and we're honest with each other, he said. We know that sometimes on both sides of the Atlantic, we have drifted apart and forgotten our shared destiny. 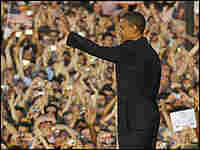 On the campaign trail, you often hear Obama talk about change and hope. There were glimpses of those themes in his speech today. He challenged both Europeans and Americans to fight for a brighter future that guarantees human rights, equality, and opportunity. Senator OBAMA: We must remember that the Cold War borne in this city was not battle for land or treasure. Sixty years ago, the planes that flew over Berlin did not drop bombs, instead they delivered food, and coal, and candy to grateful children. And in that show of solidarity, those pilots won more than a military victory. They won hearts and minds, love and loyalty and trust - not just from the people in this city, but from all those who heard the story of what they did here. Now, the world will watch and remember what we do here - what we do with this moment. Will we extend our hand to the people in the forgotten corners of this world who yearn for lives marked by dignity and opportunity, by security and justice? Will we lift the child in Bangladesh from poverty, and shelter the refugee in Chad, and banish the scourge of AIDS in our time? Will we stand for the human rights of the dissident in Burma, the blogger in Iran, or the voter in Zimbabwe? Will we give meaning to the words never again in Darfur? Senator OBAMA: Will we acknowledge that there is no more powerful example than the one each of our nations projects to the world? Will we reject torture and stand for the rule of law? Senator OBAMA: Will we welcome immigrants from different lands, and shun discrimination against those who don't look like us or worship like we do, and keep the promise of equality and opportunity for all of our people? Senator OBAMA: People of Berlin - people of the world - this is our moment. This is our time. CONAN: Barack Obama speaking today in Berlin. Joining us now is Constanze Stelzenmuller, the director of the German Marshall Fund in Berlin. She is with us in the studios at the BBC Berlin in Germany. Nice to have you with us. Ms. CONSTANZE STELZENMULLER (Director, German Marshall Fund, Berlin): How do you do? Thanks for having me on the show. CONAN: And with us here in studio 3A is Ron Elving, NPR's Senior Washington Editor. Ron, always good to have you on the program. RON ELVING: Good to be here, Neal. CONAN: And Constanze Stelzenmuller, let me turn to you first. Clearly, one of the audiences that Barack Obama was addressing was in Berlin and in Europe today, and you'd have to think that from watching the television coverage and seeing the crowd waiving American flags, the receptions was rapturous. Ms. STELZENMULLER: Yeah, it was very attentive. It was very, very interested and I think people who came away very impressed. I actually met a German parliamentarian leaving the speech and he said, you know nobody here could have drawn this kind of crowd to this place. CONAN: Nobody there could have drawn that kind of crowd. It is astonishing, Ron Elving, from an American's point of view, to see a huge crowd gathered in a European capital waiving American flags. ELVING: There has to be something of a curiosity factor, but we have seen over and over in the polls in recent weeks and months that Barack Obama - if he's something of a phenomenon in this country is truly a phenomenon in Europe. People are fascinated with him. He's a new kind of American politician. It is, of course, partially his race. But it's also his age, it's the nature of his rhetoric, the nature of his vision, the nature of the way that he is actually talking about a kind of international approach to problems which I think is highly popular in Europe. CONAN: And I was going to just ask Constanze Stelzenmuller about that. No one nation, no matter how large or powerful, can defeat such challenges alone. That is a message that many in Europe have longed to hear. Ms. STELZENMULLER: It's a remarkable statement. An admission that even the world's sole remaining super power finds itself faced with challenges that it cannot defeat on its own and certainly not with military might. To be fair, I think the Bush administration in recent years has come to realize that; and if not saying so, has certainly acted on that understanding, on that insight. But to have it said in the middle of Berlin in Tiergarten in such a historic place is extraordinarily meaningful of course. CONAN: Yet, he also challenged Europeans and specifically Germans. Earlier in the day, he'd met with Chancellor Angela Merkel and one of the things they talked about was Afghanistan, and she had said no, no more German troops are going to Afghanistan, and he called for German troops to be sent to Afghanistan. Ms. STELZENMULLER: Well, I think people sometimes forget just how many German troops already are in Afghanistan. And that recently, the Germans have sent several hundred more. I think 600 more to fill a rapid reaction unit in the north. The truth of the matter here in Germany is that we too are moving into an election year. The federal elections will be in September 2009, country's run by a very fractious grand coalition between the conservative and social Democrats. And the public is critical of this. Of any president, whether he's called Barack Obama or John McCain will have to manage this kind of issue very carefully. CONAN: And Ron Elving, there is - of some people have noted an election that - in this country in this year ahead, this was clearly part of that campaign, this is something that Barack Obama, that image of him in front of that huge crowd in Europe waiving American flags. It's going to be indelible. ELVING: Yes, it's an image. It's a video image. It's a photographic image and he also invoked a couple of other historic images in his remarks today, talking about the Ich Bin Berliner speech note that John F. Kennedy gave in 1961 when he visited Berlin and the shadow of another Berlin Wall crisis. Then of course, he talked about Ronald Reagan and the famous, Mr. Gorbachev, tear down this wall speech, in the 1980s which of course did lead to the eventual destruction of the Berlin Wall, not so much literally by Mikhail Gorbachev as by the Berliners themselves. The Germans themselves in an atmosphere that Mr. Gorbachev helped to create. And he also made reference of course to the Berlin airlift of 1948, quite a historical sweep 60 years in taking an awful a lot of history, a lot of changed relationships between a lot of different countries. Illustrating among other things, that no matter how great the challenge of a particular time may seem it can be overcome with the kind of consorted action we've seen in the past and the kind of political leadership that we've seen in the past. CONAN: Constanze Stelzenmuller, the opposition in this country is trying to portray Barack Obama as inexperienced, a man who will have hard time finding his feet in foreign affairs given his performances. Germans have watched it from the Middle East and now to Berlin. How's he doing? Ms. STELZENMULLER: It seems to me that hitherto he hasn't set a foot amiss during this trip from what I've seen. He's behaved in an exemplary way, not crossing anyone, not making any mistakes. And the great challenge of this speech, of course, was to straddle the transatlantic, if you will, rhetorically. Appealing both to Americans and to Europeans, and to the Americans in the audience. Don't forget they're about 20,000 Americans living in those (unintelligible) and I bet some of them were waving those American flags. But the other interesting part of the speech was, of course, that it wasn't just a speech about history as Mr. Elving just said very, very rightly. It was also a very modern speech. It was about globalization. What he was saying was that we have overcome the challenges of the 20th century together. But now the 21st century, we find ourselves faced with issues, with challenges, where we realize we really are intertwined. We no longer are separate and therefore we must deal with these responsibilities together. That's a very appealing message in Europe, where the European union has brought people together in a way with the unknown in the rest of the world. CONAN: Constanze Stelzenmuller of the German Martial Fund in Berlin, Ron Elving of NPR News here in Washington, and you're listening to Talk of the Nation from NPR News. And we have a caller on the line, Augie is with us. Augie calling our set from Berlin. AUGIE (Caller): Hi. I'm an American who's been living in Berlin for 22 years. I was one of the very many Americans that went to see Barack Obama this evening. And I was, first of all, I was struck by the number of young people that were in the audience. I would say around where I was standing, which was way far back from the (unintelligible) because I got there only an hour in advance, I would say 70 to 80 percent of the people around where under 30. So I was, first of all, amazed at the youth of the people who came to see him. That was one comment I had. And the second comment was that because of this youth, I think when he talked about the reasons why Germans love the United States, the reason they have namely the airlift, the support of Berlin. These young people know this mostly from history and when he talked about how much he loved America, I heard a definite rumble go through the audience. That doesn't go over so well with young Germans. I couldn't imagine a young German ever saying, I love Germany. He would be labeled right-wing extremist if he did that. CONAN: That's interesting. Ron Elving, that part of the speech though may have been intended for the other side of the Atlantic Ocean. ELVING: Yes, indeed, as many parts clearly were. There was another moment where, as the caller probably also observed, he said America has not perfected itself, but the reaction of the crowd at that point was a little bit, not exactly jeering, but that there was a little bit of that same spirit of, yeah, no kidding, from the audience particularly I imagine of those younger Germans. And Augie, what did you think of the speech? AUGIE: Well, I liked it. I think I was expecting a little bit more of a campaign speech than something that was so general. I mean, it was of course, from that content, it was, it was very moving. It was a very moving speech, but I was kind of expecting a few comments about John McCain. I was expecting a few comments about George W. Bush, but I guess it's diplomatically improper for him to criticize his government in another country. It wasn't quite what I was expecting. CONAN: Well, Constanze Stelzenmuller, he began his speech by saying I'm here as a proud citizen of the United States... Ms. STELZENMULLER: Yes. CONAN: A fellow citizen of the world as a candidate for president. I speak to you though not as a candidate for president. And it seemed to be that he was trying to pull off the statesman-like role and very much, speak as if were the president of the United States. Ms. STELZENMULLER: Well, in a sense, you know, you really had to cross all, you take off all the boxes I think is the expression. And I think that that was an almost impossible task, and I think he fulfilled it almost perfectly, frankly, really. He appealed to history, he appealed to modern sensibilities and fears and hopes. He appealed to the Americans and to the Europeans. I'm not sure I agree with the caller that for somebody, an American presidential candidate to say he's proud of America, we wouldn't think of that as right-wing. I think that's perfectly okay for somebody to do. And you know, the German I think have learned to be a little more relaxed about themselves in recent years, with the soccer World Cup and other things as well. But I think his - he got a very, very respectful audience. And as I said, I don't know of a German politician who could draw 200,000 people in the middle of Berlin on a perfect balmy day. It was pretty impressive. CONAN: Augie, thanks very much for the call. Appreciate it. CONAN: Bye bye. And Constanze Stelzenmuller, thank you for being with us. Ms. STELZENMULLER: Thank you. It was a pleasure. As always. CONAN: Constanze Stelzenmuller is director of the German Marshall Fund in Berlin and a former reporter and editor at Die Zeit. She joined us today from the studios at the BBC Berlin in Germany. And Ron Elving, as always, thank you for your time. CONAN: Ron Elving is NPR Senior Washington Editor and joined us here today in Studio 3A. Tomorrow, Ira Flatow will be here on Science Friday. I'm off on vacation next week. Lynn Neary sits in for me, so have a great weekend everybody, and we'll see you in a couple of weeks. This is Talk of the Nation from NPR News. I'm Neal Conan in Washington. View a transcript of Barack Obama's speech in Berlin. 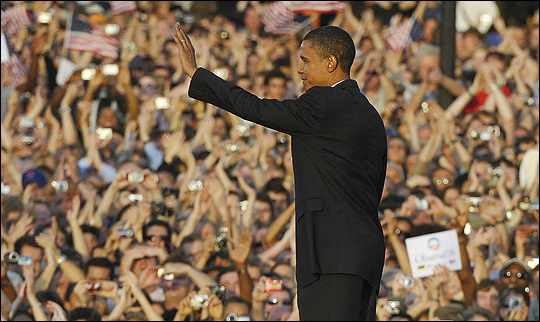 Sen. Barack Obama waves to the crowd after making a speech in front of the Victory Column in Berlin. Sen. Barack Obama addressed an expansive crowd Thursday near the site where the Berlin Wall once stood, calling on the U.S. and Europe to build new bridges of partnership "to protect our common security and advance our common humanity." The Democratic presidential hopeful's speech was the centerpiece of a tour through Europe aimed at reassuring skeptics at home and abroad of his ability to lead and to move the cross-Atlantic alliance in a new direction. "The walls between old allies on either side of the Atlantic cannot stand," Obama said at Berlin's Tiergarten Park, alluding to often strained relations between Europe and the United States during the Bush administration. "While the 20th century taught us that we share a common destiny, the 21st has revealed a world more intertwined than at any time in human history. "Partnership and cooperation among nations is not a choice; it is the only way, it is the one only way, to protect our common security and advance our common humanity," he said to a crowd that Berlin police estimated at more than 200,000. "This is the moment when we must defeat terror and dry up the well of extremism that supports it. This threat is real and we cannot shrink from our responsibility to combat it." The Illinois senator drew loud applause at several points during his speech, which used the Berlin Wall, a Cold War icon which was demolished in 1989, as a metaphor for divisions that continue to separate humanity. "The walls between races and tribes; natives and immigrants; Christians and Muslim and Jew cannot stand," he said. "These now are the walls we must tear down." Sen. Barack Obama spoke in Berlin on Thursday during his whirlwind trip through Europe. In the speech before thousands of onlookers, the Democratic presidential candidate talked about the need for Europe and the United States to work together to defeat terrorism, fight global warming and work toward peace in the Middle East. The following are his prepared remarks, provided by the Obama campaign. I know that I don't look like the Americans who've previously spoken in this great city. The journey that led me here is improbable. My mother was born in the heartland of America, but my father grew up herding goats in Kenya. His father – my grandfather – was a cook, a domestic servant to the British. Ours is a partnership that truly began sixty years ago this summer, on the day when the first American plane touched down at Tempelhof. This is where the two sides met. And on the 24 of June, 1948, the communists chose to blockade the western part of the city. They cut off food and supplies to more than two million Germans in an effort to extinguish the last flame of freedom in Berlin. And that's when the airlift began – when the largest and most unlikely rescue in history brought food and hope to the people of this city. In Europe, the view that America is part of what has gone wrong in our world, rather than a force to help make it right, has become all too common. In America, there are voices that deride and deny the importance of Europe's role in our security and our future. Both views miss the truth – that Europeans today are bearing new burdens and taking more responsibility in critical parts of the world; and that just as American bases built in the last century still help to defend the security of this continent, so does our country still sacrifice greatly for freedom around the globe. But I also know how much I love America. I know that for more than two centuries, we have strived – at great cost and great sacrifice – to form a more perfect union; to seek, with other nations, a more hopeful world. Our allegiance has never been to any particular tribe or kingdom – indeed, every language is spoken in our country; every culture has left its imprint on ours; every point of view is expressed in our public squares. What has always united us – what has always driven our people; what drew my father to America's shores – is a set of ideals that speak to aspirations shared by all people: that we can live free from fear and free from want; that we can speak our minds and assemble with whomever we choose and worship as we please.